under the trees, even living in trees. If we could understand the trees, we would see the stories of old times through the eyes of nature. We could learn immensely." The actual work is, after the worldwide success of Watermark (1988) and Shepherd Moons (1991), the third solo album, which the Irish singer filled with her unique, atmospheric sounds. 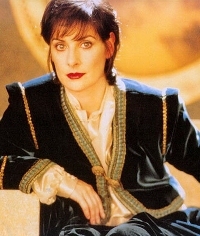 As always the expensively produced songs were made in Enya's own studio on the outskirts of Dublin, with hundred times via multitrack technique overlaid voices and harmonies. A method of production which needs time, patience and a good team. Enya was born in 1962 as youngest of six children in Gweedore in County Donegal. At 18, she joined her elder siblings and became singer and keyboard player of the legendary band Clannad. At 20 the producer/lyricist/manager couple Nicky and Roma Ryan took the talented musician under their wing. For six years they worked in the team on a special Enya style. Roma had collected diary notes, poems and stories for years, which she changed now to Enya song lyrics. They mostly deal with astrological wonders, old hymns, sea myths, fairies, angels, figures out of legends, but also about faith, hope, comfort and strange lands. "In my songs I can travel where I want. I can fly, float, swim. Roma's lyrics give me the most beautiful possibilities." In reality Enya cannot swim, but she loves to walk in the hills surrounding Dublin. "I'm often working long and late, sometimes I seem to lose myself in the work." Nothing here is left to the computer alone, everything is recorded over and over, Nicky Ryan sitting at the controls of a mixing desk specially made for him. The ethereal music of the nature lover is sometimes smiled at as being a "New Age derivative" or categorised as a "folk-like ambient music" - not to the pleasure of its creator. "My songs can be found in all charts, be it New Age, Classical or Pop. One single category would be unpleasant to me - my music is too precious." The material fruits of this preciousness are considerable: two cottages with studio and some horses. Enya seldom reads, listens only to her own music and has neither husband nor fiancé nor boyfriend. A life only for music? "It makes me infinitely happy!" Note: Andreas Iwanowitsch, photo provided by Andreas Wilke. Post to the Enya Mailing List on February 26, 1996. There are a number of factual errors in this article. They are present in the original text and are not the fault of the transcriber. The original German text is also available.